With the growing need for audio & voice quality requirements, a device is needed to support this for professional and personal use. 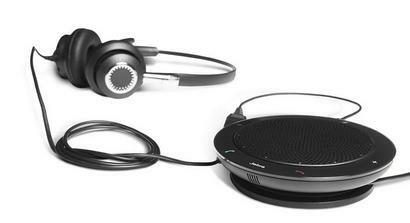 Jabra Speak 410 is a speakerphone especially designed for audio conferencing. It functions both as a speaker and a microphone that includes a simple plug-and-play functionality. It has an omni-directional microphone which you can use anywhere in a room (360-degree) and you don’t need to speak to the device directly at close range, allowing people to hear and be heard clearly. Jabra Speak 410 can be very helpful to those who are doing teleconferencing, office meetings, virtual jobs, online chats or even just listening to music. It is disc-shaped, measures 13 centimeters in diameter, and comes with a travel case that enhances portability. The length of its USB cord is 71 centimeters long and can be wrapped around the base when not in use. This is actually a product that I need when I have online meetings, need to attend some webinars, listen to music on Youtube and watch movies on DVD. When I use my laptop, the sound volume is not enough for me to hear clearly what I’m listening to or watching. So I would still need to plug in my headset to hear the sound clearly. And if I don’t like to use a headset because I would need to multi-task, I can just plug in a Jabra Speak 410 and be more productive without being glued to my laptop. “With the high proportion of mobile workers, growing number of SMEs, remote and home offices in the country, the Jabra Speak 410 is a valuable tool to simplify office communication and improve business productivity. It’s ultimately all the mobility and freedom you can ask for,” remarks Ralph Ede, Managing Director for Jabra in South Asia. In the Asia Pacific region, the product was first formally launched in the Philippines held at the Hotel Intercontinental in Makati City on March 10, 2011. 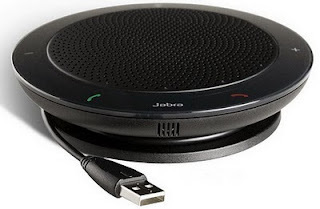 As soon as you plug in the Jabra Speak 410 to a USB port, the hardware is detected immediately by the system. In case the hardware is not detected, you may use the CD that comes with the product to install the drivers. Just make sure that you have the latest Jabra PC Suite which can also be downloaded for free thru www.jabra.com/PCsuite to fully maximize your voice and audio experience. Firmware will be free at all times. Users will be notified if a new firmware is already available for download to update the software. Jabra Speak 410 boasts of its sleek design and superior sound quality. But if you want to listen to a conversation or music privately, there is a 3.55mm jack at the rear side of the device where you can plug in your head phone. You get to listen privately and at the same time use the device as a microphone, and switch to private call mode. The device also has control buttons. On top, there is a mute button. At the left side, there is a call button (green phone symbol) and at the right side, you’ll see the red phone symbol for the disconnect button. This means that you can answer or disconnect a call when the need arises without navigating to your desktop. There are also 12 LED lights in circular form that glow as you increase the volume. The product comes in 2 versions: (1) Jabra Speak 410 that is compatible with all leading Unified Communications (UC) solutions, including Cisco, Avaya and Alcatel-Lucent. But you need to install the latest Jabra PC Suite to enable call controls; (2) Jabra Speak 410 is MS optimized for Miscrosoft Lync 2010 and requires no additional software or drivers. The product is being supported by Windows XP, Windows Vista and Windows 7. So this can stir a problem for a Mac user like me. Ere explains that on Mac OS and Linux, the product would function as an audio device with limited functionality. I just hope that Jabra will create soon an improved speakerphone that can be compatible with any operating system so more customers can enjoy this great product. Despite of the product’s great features, it still has another downside. Jabra Speak 410 cannot be used with any voice recording device, and neither with a mobile phone. The suggested retail price of this product is at US$159 (PhP6,500-7,000) which for me seems very costly, especially for personal use. Its warranty covers a 2-year period and is valid globally.